The most common plastics used to manufacture cable ties are polyethylene, polypropylene, and nylon. These commodity plastics can come from thousands of sources including original manufacturers, compounders, and recyclers. Often the point of origin is price dependent and can change with each production run. While these cable ties are inexpensive, their performance in critical applications is inadequate and prone to failure. No Flammability – In applications where a fire is a possibility, polyethylene, polypropylene, and nylon polymers act to fuel and propagate flame spread. Because Strong-Ty™ cable ties are made from Kynar® PVDF any flame in atmospheric conditions is self-extinguishing and will not result in fire propagation. No UV Degradation – Cable ties made from polyethylene, polypropylene or nylon cannot be used in outdoor applications without the addition of UV stabilizers. Because of the strong chemical bonds found in Kynar® PVDF, Strong-Ty™ cable ties require no additional UV stabilization. No Moisture Absorption – Nylon 6,6 can have a loss of tensile strength up to 40% in humid environments at ambient temperature. Strong-Ty™ cable ties have zero moisture absorption even at elevated temperatures. Excellent Chemical Resistance – Strong-Ty™ cable ties provide superior chemical resistance in aggressive environments such as sulfuric acid (H2SO4), hydrofluoric acid (HF), hydrochloric acid (HCl), hydrobromic acid (HBr), nitric acid (HNO3), phosphoric acid (H3PO4), acetic acid (CH3COOH) and chromic acid (H2CrO4) at a range of concentrations and elevated temperatures. A guide to the chemical resistance of Kynar® PVDF is presented here. Full Product Traceability – Each cable tie has a number and a manufacturing date. The number corresponds to the injection mold cavity. The manufacturing date corresponds to a production record which details material, lot number and process conditions. Lot numbers can be traced back to Arkema and their Kynar® PVDF manufacturing records. It’s not a long path, but it is a critical one and often not possible for cable ties manufactured from commodity plastics or cable ties not made in the US. Low Extractables – Extraction results from Arkema for Kynar® PVDF in DI-water at 80°C are shown in the following table. These fractional-ppb results show the cleanliness of Kynar® PVDF. No Environmental Stress Cracking – Commonly occurs in senicrystalline polyethylene, polypropylene, and nylon and results in premature crack formation and failure of the polymer in environments where the applied tensile stress is low and a stress cracking agent such is also present. Stress cracking agents can include salts, adhesives, plasticizers, acids and in the case of nylon 6 and nylon 6,6 even water! Environmental stress cracking should be tested in advance for cable ties used in critical applications. Select Strong-Ty™ cable ties and eliminate this problem. Superior Manufacturing – Injection molding is a critical step which can easily allow contamination into the final cable tie product. 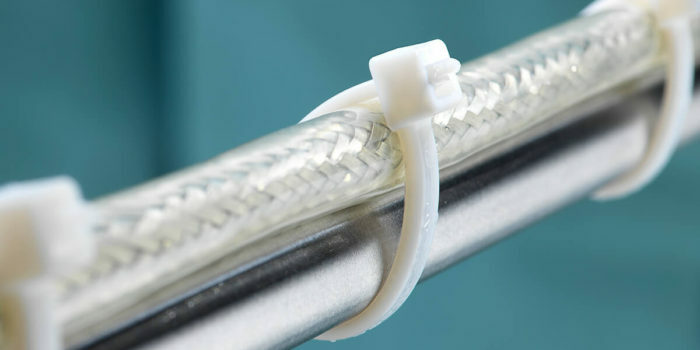 Every Strong-Ty™ PVDF cables tie is manufactured following an audited and certified ISO 13485 procedure. Every step used in producing our Strong-Ty™ cable ties is optimized and documented so that the final product can be successfully reproduced at any time in the future. Also, all Strong-Ty™ cable ties are manufactured and packaged in a cleanroom environment. One more improvement used by Nile Polymers to make the best cable ties in the world. No Additives – A Strong-Ty™ PVDF cable tie provides excellent long-term performace because of Kynar® PVDF and does so without any reliance on additives such as thermal stabilizers, flame retardants, UV stabilizers, colorants, and plasticizers. No additives mean no extractable or leachable contaminates in your process, product or manufacturing environment. No Regrind – Reuse of the spur and runner materials is a standard approach in injection molded products such as cable ties. These items are ground or chipped into small flakes using equipment that easily allows contamination and impurities back into the product stream. How much regrind material is acceptable? Nile Polymers believes the answer is zero. Our Strong-Ty™ cable ties are made of 100% pure Kynar® PVDF. This practice minimizes contamination and produces the cleanest possible cable ties.